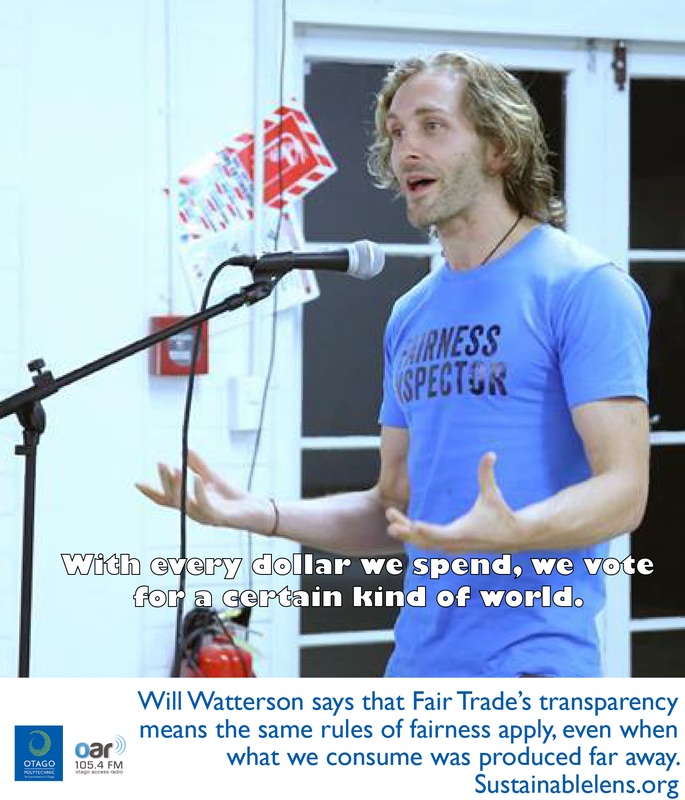 Will Watterson works in advocacy and public engagement for Fairtrade Australia and New Zealand. Will was in Dunedin accompanying Fair Trade coffee grower Daniel Kinne. We discuss the role of Fairtrade, and explore the role of the story in fostering change, especially in ethical consumerism. We ask what is fair? and how to engage people in this process? (notably though campaigns such as the Great Kiwi Fairness Debate). I got involved in volunteering at the beginning of high school, I thinks that’s where I got my first taste of how it made me feel good to give to others and see other people’s lives improve and transform – and I’ve chasing that feeling ever since in the work that I do. The idea of taking information and transforming that information into a story…to understand that human beings are story people. Our lives, and those of others around us inform our story. Being able to take information…to distil it and shape it into story form, so that it is more easily digestible, and people are more easily able to connect it to their own lives and their own value systems, that’s what I learned in my undergrad (English Literature and Theatre). The industrial revolution was very helpful in many ways – to mechanise as many things as possible, to remove us from the sources and human side of the things that we wear, touch and eat…what attracted me to Fairtrade…was not only the Fairtrade premium…but that I could pick up the coffee packet and read about Daniel and his cooperative in Papua New Guinea…and feel a little bit more connected to the human beings who are doing an incredible amount of work to grow and harvest the coffee. What is the future that we are wishing to create? What is our utopia, where are we heading as a society? And we know that if everyone in the world lived the way Americans do, or New Zealanders, and consume the way that we consume, we’d need 4 or 5 planets to do that. It’s about acknowledging the fact that we do consume – we do take things from the planet, so if we can reduce the amount we consume, and the energy we use, fantastic..
It’s about acknowledging that every day we spend money, and every dollar we spend is like a vote. We’re voting for a certain kind of world with every dollar that we spend. When you spend a dollar, are you spending on things that empower the people who produce that product? Are you spending your dollar on things that are supporting sustainable practices rather than unsustainable practices? It’s about becoming aware about where the things that we consume come from, and what kinds of practices and mentalities that we want to support with out consumer dollar. I like to take a simple approach. I like it but do I really need it? Will it really make my life more fulfilling? Not necessarily – so we can reduce the amount of things we consume. The things we do buy, need or want – do I need coffee? I love coffee, I’m going to keep buying it – so I’d like to know that the coffee I buy is grown sustainably and is empowering for the people who grow it. (Live below the line) A way of being to put ourselves in the shoes, however inadequate the metaphor is, for a few days, a week, of our brothers and sisters living in extreme poverty – I find that really powerful. We are indebted to half the world. The genesis of Fairtrade was the injustices, imbalances and inequities in global trade practices. Fairtrade has developed alternatives, but we want to move back into a space where we are protesting again. Still proposing the Fairtrade alternative, but working with the other players in the Fairtrade movement to protest those injustices that are still occurring in the global trading system. 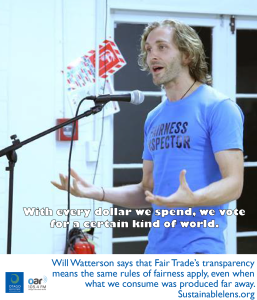 In an ideal world, Fairtrade does itself out of a job as consumers demand transparency right through the supply chain system. By buying the Fairtrade mark, you are supporting the infrastructure of being able to audit the transparency of the supply chain. (Great Kiwi Fairness Debate) Exploring the notion of fairness…stealing people’s parks when they are about to turn in, or taking the last chocolate biscuit…then segway from everyday fairness to interacting with our global neighbours. A lot of things we consume are made far away, but why should our ethical attitude be any different? There’s no reason why Fairtrade should be more expensive if you accept that more of the value is going to the growers than to the other players in the supply chain. As a consumer, I just want to know, is what I’m buying sustainable and ethical? And that’s what is great about the Fairtrade mark. (Activist?) Change agent. People think of activist as an angry person who is walking down the street throwing things or carrying a big sign. I think there is a time and a place for getting angry. But at the end of the day, being an advocate for change, I’m an advocate for change there all kinds of levers you can pull on for making change, I’m a big fan of working alongside people, and working within to change policies. It’s important to get messages out there, to continually have conversations at multiple levels of society about what is and isn’t working, and what needs to change and how we can do that. People aren’t necessarily interested in the run of the mill, the average product any more, people are interested in the remarkable – things that have a story, that are special. Being special, remarkable is the way of the future, and that doesn’t preclude have sustainable practices. (Motivation?) Fairtrade coffee in the morning. Little things…inspired by impacts of stories. (Challenge?) If you spend enough time, it’s easy for your friends, society to put you in a box “you’re that guy”. My challenge is to avoid being stereotyped. Constantly reconnect as mainstream kiwi whole just happens to be concerned about social and environmental issues. I love New Zealand and our culture and the way we do things so much, I can’t not leave it alone. I can’t not be part of the group of people who are always looking at ways to improve it. (Miracle?) If I was to wake up tomorrow morning and know that as I potter around my house, everything I am wearing and touching and interacting with, was produced with love, by someone who loved what they were doing and was living a happy thriving life wherever they were. (Advice?) Look out for the Fairtade mark. Whenever you encounter these kinds of things, just take it one step at a time. Just change one little thing. I like my coffee, so I change that. Just take those little steps, because as you take one step and that becomes regular, it becomes a habit – and habits don’t take effort to maintain. As we build up those habits, suddenly we’ve transformed the way that we live and we’re far more sustainable and happy.